The other day, a busy and rainy Sunday afternoon, as Gui and I were leaving McDonald's to get on with the day, a young boy stopped me and asked me if I had a euro. We were still inside the McDonald's when the boy approached me, and I had to ask him to repeat himself because I wasn't really sure what he said the first time. When I understood that he was asking me for a euro, I told him, "no," continued walking out of the restaurant and then proceeded to feel like the scum of the earth. Being asked for money from strangers has just become part of my daily life as a Parisian city-dweller. I come across homeless people on a regular basis, and I've managed to grow a thick skin of indifference, knowing that my usually overly-emotional self is just not suited for denying a beggar some change. But, it wasn't until I firmly and quickly rejected this child's bid for a bite to eat that I realized how cold and callous I'd actually become. I walked by the McDonald's again a few minutes later and saw the boy sitting at a booth eating a burger. I wanted to cry. 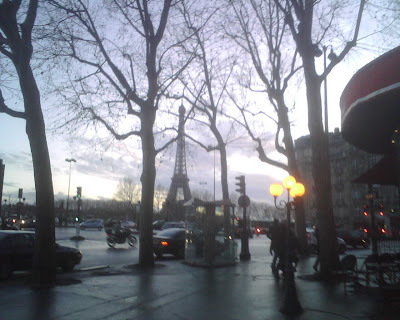 A friend of mine makes it a point to give food and not money to beggars he encounters on the streets and in the tunnels of Paris, and I generally agree with that approach. But, rarely do I find myself with an extra piece of fruit or bag of chips in my handbag, and sometimes it's just not all that practical for me. And, I realize the trouble with handing out cash to people when they ask for it; that there's an organized ring of criminals who make people beg and take their money, but how am I supposed to pick and choose who I help and who I don't help? I understand now that I should have asked the boy what he wanted to eat, bought him his Happy Meal and made his day instead of flatly rejecting him a slice of happiness that I could so easily have provided. But what if someone older had approached me instead? I might have felt less guilty knowing I'd said no to an adult and not a child, but is that morally OK? There are a lot of things that I have changed about myself to adapt to living here, but I refuse to let my moral compass be one of them. Of course nobody has asked me to change, to become a different person or to conform to the norms of my new social setting; any changes I've made about my personality or my habits have solely been self-imposed. But, I'm realizing the high price my need to "fit-in" has cost me, and I don't plan to continue paying it. If I can spare some change to make someone happy or buy a cheeseburger to feed a hungry boy, there's no reason I shouldn't. I won't be able to feed the world or make everyone happy, but at least my humanity will remain intact, and really that's the only thing that fits in everywhere. I'm loving that the days are getting longer and the temps are getting milder. Although we've had a few intermittent weeks of crazy-cold snowy days (and we're still hanging around the 40s and 50s), it seems like we may be saying goodbye to the worst of winter as we roll into March. 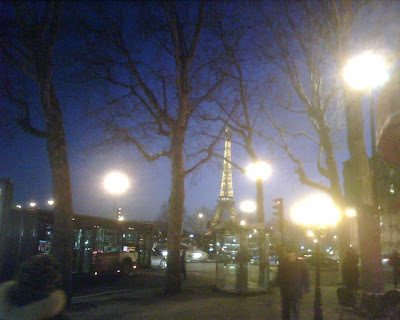 It definitely makes me happy to leave work and still see so much lingering daylight - the promise of springtime in Paris so easily makes the stresses of a long workday disappear. We bought our tickets to visit Texas in June and it couldn't come soon enough! I'm dying to meet my new nephew, Jacob and see all of my other nephews and family! Gui and I have been getting back into the habit of Sunday brunching. Le brunch is apparently the "it" thing to do in Paris, so we try to get out and about as early as possible to avoid the long lines. 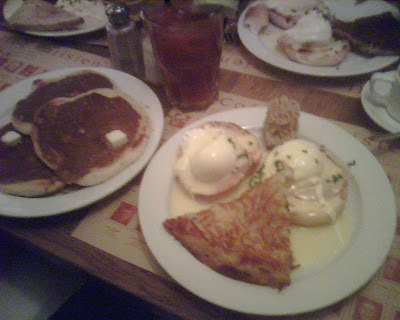 We just re-established our brunching routine 3 weeks ago, and so far we haven't had a bad meal, yet. 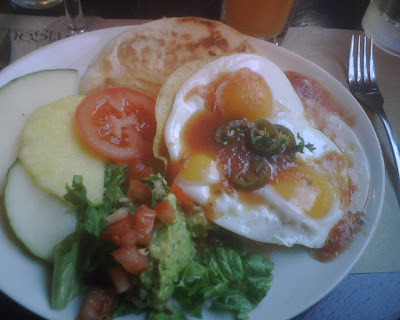 I never knew how close a mouth-watering plate of eggs benedict and huevos rancheros were until now! I've been spending every spare moment I have clicking my needles away to finish my first adult-sized sweater that I'm proudly making for yours truly. It's been a really fun project so far and I haven't even yet arrived at the fun part - the patterened yoke! My French is still progressing, but I realize weekly how far I still have to go when it takes me half an hour to write a short email. We finally booked our train tickets for a long weekend of skiing with friends in March. I've never been snow skiing before, and I'm pretty stoked about having my first go at it in the heart of the Pyrénées mountains. I'm waiting for some new clothes pattern books to arrive in the mail - I plan on taking advantage of my proximity to French fabrics and will be jumping back into sewing this spring. My dust-collecting sewing machine will finally get the attention it deserves! I've been missing my Texas friends a lot lately. I dream daily about being back in Austin, getting together for dinner or pints or weekly yoga clases and simply enjoying each other's company. I really miss the spontaneity and ease of my life there, but knowing it's not such a far off dream keeps me focused on my right now. My sister emailed me about this Superbowl commercial, and I have to agree with her, it's pretty cute. Gui saw it, too, and we decided that despite it's slightly corny, happy-love-googly-eyed theme, the message is actually pretty relevant. Our relationship would be totally different without the world-wide web (as my mom likes to call it). Whether it's lame or just regularly accepted nowadays, the internet is a really large part of my life, and I don't know if I'd be brave enough to live so far away from the people I love without having it as my lifeline. I'd say Google definitely struck a chord with this one.